The leading edge is set ahead of the hosel to slip under the ball from challenging lies. Helps eliminate shanks. 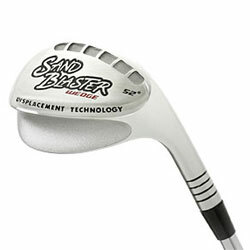 The new Sand Blaster is the ideal weapon from a sand trap, thick rough or fairway lie. Dual sole technology acts like skis in water, gliding across the sand or rough! Unique hollow 2 piece construction allows the sole width to be increased dramatically to make it the most forgiving sand wedge we have ever engineered in either soft or firm sand, and even chipping and pitching from around the green. Designed with a negative offset or face-forward feature that helps those who may have a tendency to pick or sweep the ball and makes this club virtually shank-proof. Even a poor swing will hit the ball high and land it softly. Works great in thick rough also. The oversized head and convex bottom cuts through rough effortlessly. If you want to carry only two wedges, the sandblaster coupled with our 64º Extra Lob Wedge will complete your set. Comes assembled with standard steel shaft and Black grip. For more details about the Sand Blaster, click here.